Pictured below is the train station in Bastuny, Belarus. 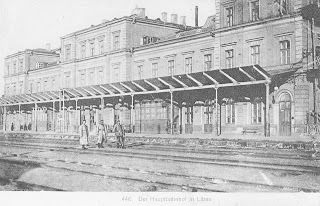 It was built in 1905 for one stop along the railroad line that ran from Romny (in today's Ukraine) to the Baltic seaport of Libau (now Liepaja, Latvia). My grandmother Anna Blaszko, whose village of Skladance was just a few miles from Bastuny, probably began her emigration to the United States at this train station. 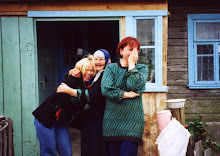 Discovering this train station when I visited Belarus in 2001 was bittersweet. It was very emotional to imagine how Anna must have felt saying goodbye to her family here. She never saw any of them again. Shipping lines provided their passengers with woven wallets to hold their tickets, passports, and other important documents. On the outside, the wallets were imprinted with shipping line contact information, as pictured below. Most important were the addresses of their ticket agents in major cities. 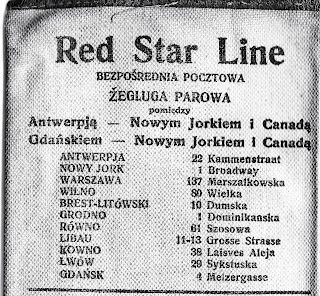 In Polish, the Red Star Line here advertises its offices in Antwerp, New York, Warsaw, Wilno, Brest-Litowski, Grodno, Rowno, Libau, Kowno, Lwow, and Gdansk. 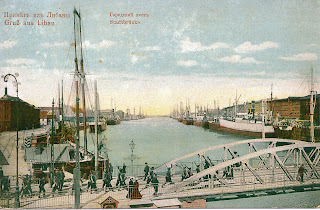 Two vintage postcards offer glimpses at Libau's railroad station and harbor in the era when my grandfather Aleksandr Prokopowicz sailed on the Russian American Line's SS Lituania to New York.